Thanksgiving is tomorrow and I know so many are in the kitchen cooking away already or may even be traveling to see family and friends. 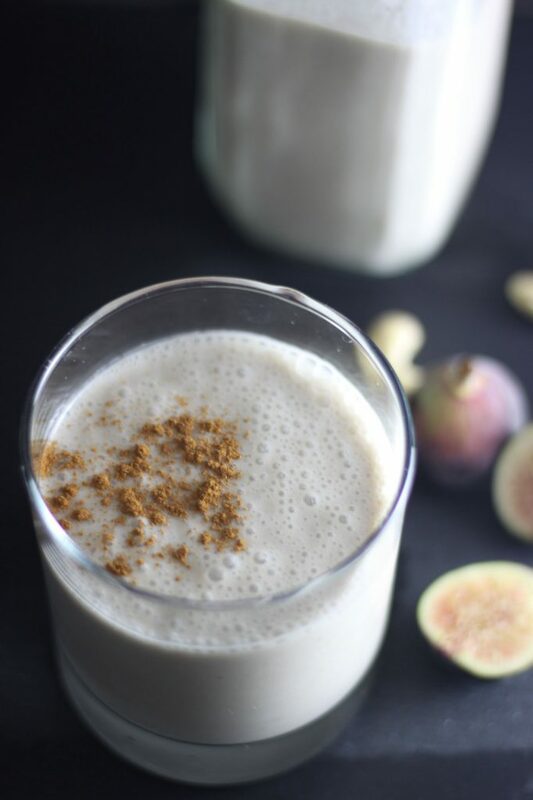 I’m posting a delicious easy Fig Nut Milk today! It’s a simply twist on nut milk and instead of using dates to sweetened the milk as I usually do I use dried Mission Figs. It’s a nice seasonal twist that makes a tasty milk to drink but is also great in oats, muesli, chia pudding, chai tea lattes, or blended into a cocktail! If you’ve never tried homemade nut milk before I hope you do soon. It’s nothing like the nut milks in stores, well unless you’re buying from a juice shop. Homemade nut milks are smooth, rich, and so creamy compared to the 1/2 gallon containers. Oh we use those regularly too and those are what I use in recipes, smoothies, and so many things. However for a special treat, when I have nuts to use up, or especially during the holidays I like to make my own. It only takes a couple of ingredients, nuts and water, plus your flavorings. Figs remind me of fall and the holidays and they are packed with vitamins, minerals, and fiber. Like I mentioned there are so many uses aside from just straight up drinking it. I really like it in oats, it makes them really rich and creamy if you stir some in after cooking. Great for soaking muesli, really delicious with Seven Sundays Vanilla Cherry Pecan Muesli! A simple chia pudding that you top with whatever you want, in my case fresh figs and almond butter or cranberries (because if you have been reading lately I’m obsessed with them this year more than ever). Delicious in a chai tea latte. Last for a cocktail, weather you are looking for a holiday cocktail, something to sip by the fire watching the snow, or maybe to help with the crazy family during the holidays (when you’re stressed to the max and “don’t give a flying fig”), you can add a little rum or make a spiced chai latte or coffee. Simply delicious and nutritious I hope you give it a try. I hope you all have a wonderful holiday week and soak up all the time with family and friends. Safe travels to those who are traveling. I’ve decided to soak up all the moments over Thanksgiving and as we will be spending the days after with families and friends I won’t be posting Friday but I’ll be back Monday with another Meatless Monday link-up! *This is not a very sweet milk which I like but if you want it sweeter you can blend in a date, add a little honey or maple syrup, or sweetener of choice. **If you want more fig flavor I like to blend the figs in after straining the milk. It is an extra step as you have to strain, pour the milk back in and blend again but to me it’s worth it. Soak cashews and/or almonds. If you are doing cashews only they need 2-4 hours, for almonds only 8-12. If I’m doing a blend I usually just go around 6-8 or right before bed until I wake up. Cover the nuts with enough cold water to come to about an inch above them. Rinse and drain nuts and place in a Vitamix with water, cinnamon, vanilla bean, figs**, and salt and blend 2 minutes or until creamy in your Vitamix or high-speed blender. Use a nut bag to strain pulp from milk. Store milk in an airtight container and enjoy within 2-3 days. Reserve pulp for other recipes such as cracker, smoothies, or protein/power balls. Perfect! I simply love figs!! Great way to use them in a nice cozy sip! I have never tried to make this! I am intrigued have a wonderful Thanksgiving! Have you ever made homemade nut milk Deborah? It’s so interesting to me how you can pretty much make milk out of EVERYTHING these days! haha! Haha yep, but nut milks have been around awhile. Of course my husband had to reference Meet The Fockers with milking the almonds. I’m so intrigued by this recipe, though I think I would add the date because I love things sweet! Yes you can add a date or two and it would be a real treat! Let me know if you do. This sounds like an amazing holiday drink! What a perfect alternative to heavy holiday drinks like eggnog! Thank you! Yes it would! What an interesting combo! How did you ever come up with that? Thank you! It’s a regular nut milk I make I just decided to swap the dates for figs for a less sweet milk and a seasonal twist. OH WOW! This is such a great idea, to mix things up over the holidays, cheers to you! I’m obsessed with figs!! I love how creative this is- it’s simply genius! I like them too but was really disappointed with the selection of fresh figs around here this year. 🙁 Thank you! Wow that’s genius! I’ve never thought about using figs like that. And your photos are gorgeous! Thank you Liz! It was really a fluke to get dark photos like this as they aren’t my typical style but I had to work with what I had and the weather we were having. Haha pretty much! 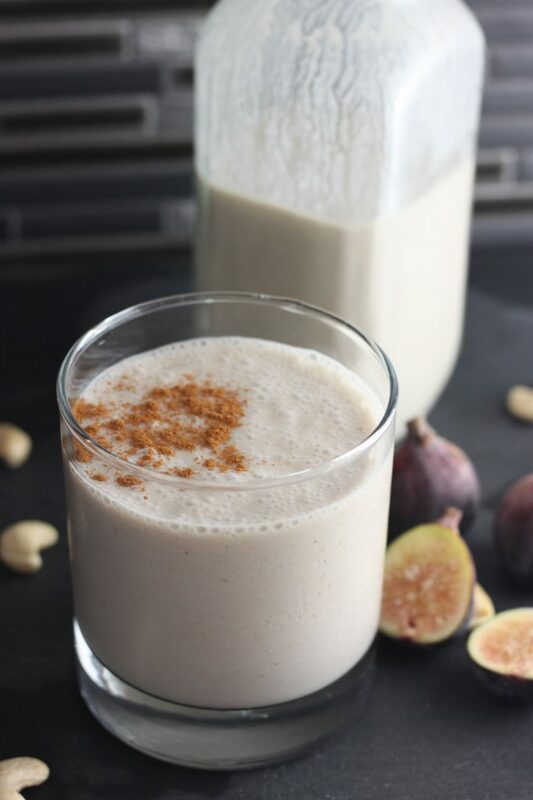 It is a regular nut milk I make, I like a blend of cashew and almonds and this one is posted way back on the blog and I just swapped out the dates for figs for a less sweet seasonal twist. Then adding in a date if I want it sweeter. Hope you had a great Thanksgiving too Amanda! What a delicious flavor combination! It looks fairly easy to make too! Thanks for the recipe. Thank you and yes it’s pretty quick and easy! Yay for nut milk! I haven’t made that in the longest time! The addition of figs in this sounds wonderful! I don’t usually make it as much in the spring through fall months but I love the richness of it in the winter! I have never tried to make my own nut milk before – I had no idea how easy it is. I love the addition of figs here too. So festive and perfect for tomorrow!! Can’t wait to try this recipe, Sarah! It’s so easy to make I hope you try it Rebecca! If you want a standard or sweeter one you can make my Vanilla Cashew Almond Milk posted awhile back. If you try any nut milks I’d love to hear what you think. You even used fresh figs, I love it! I once made warmed almond milk with figs, but hadn’t tried it this way – yum! Alisa Fleming recently posted…Panago Pizza: Dairy-free Cheese, Vegan Pepperoni and More! I used dried figs Alisa. I happened to get my hands on a few for the photo. The fresh fig selection has been very disappointing here this year. 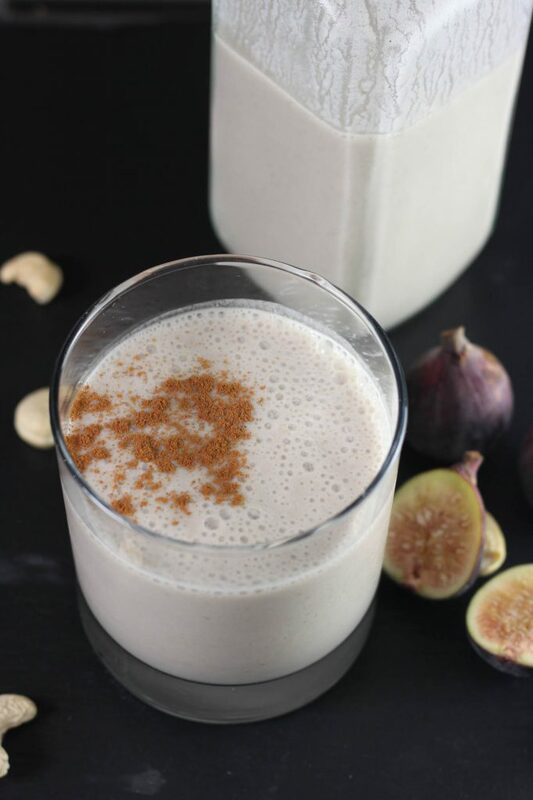 Warm almond milk with figs sounds fabulous! 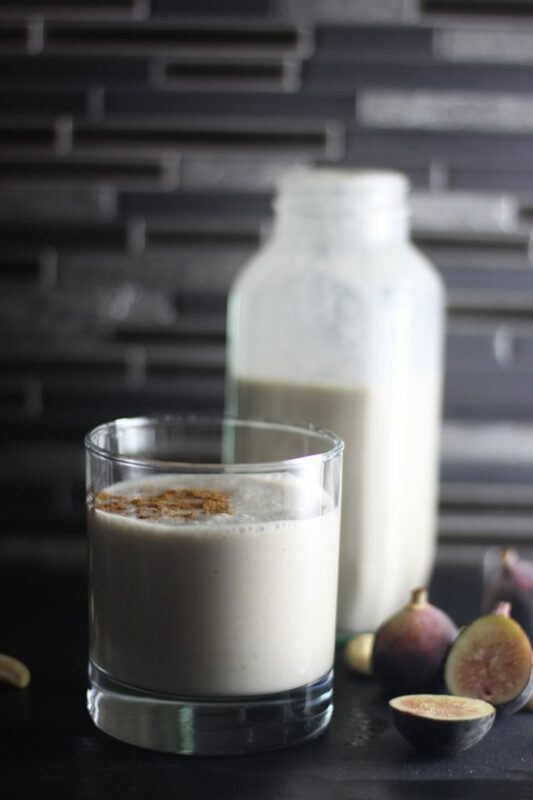 i love the taste of figs in general and turning them into fig milk sounds like a great idea. I always thought making milk sounds so hard. But you just completely simplified it. Way cool! Making nut milk is so easy! I hope you give it a try. I usually use dates too but wanted to try something different and this worked out great. Not as sweet but it’s a nice seasonal twist! I need to try this! It sounds similar to a spiced almond milk recipe I adore. Thank you Jill, spiced almond milk sounds delicious! You can add more spices, if you try it let me know what you think Is the spiced almond milk like a mulling spice like flavor? Hope you had a wonderful Thanksgiving and made more great memories! 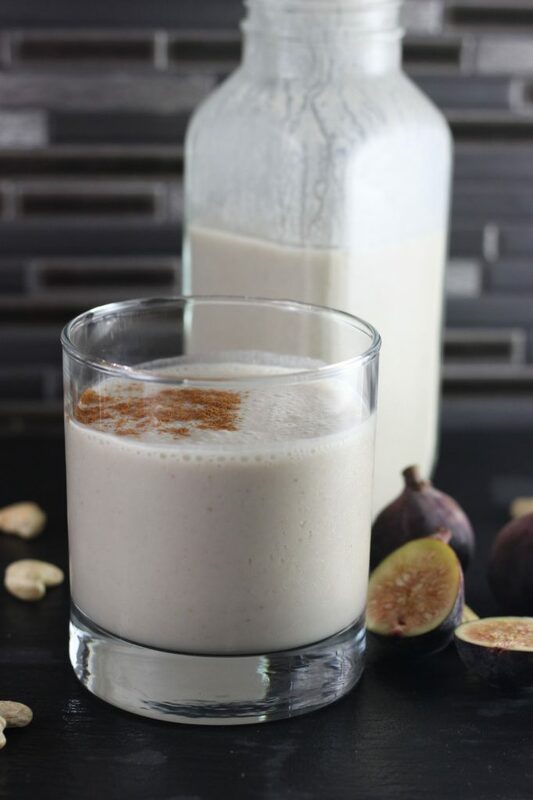 Love that you did a seasonal twist on this nut milk and used the dried Mission Figs! Would love a tall glass of this right now! Taylor Kiser recently posted…Shop Less. Run More. Thank you Taylor! We had a wonderful Thanksgiving and holiday weekend up north with friends and made lots of memories and relaxed, it was so nice! Hope you had a wonderful Thanksgiving as well. I make my nut milk very similar but with dates, this sounds fantastic!